6549 ✉ 199DZ 5 Pfg. 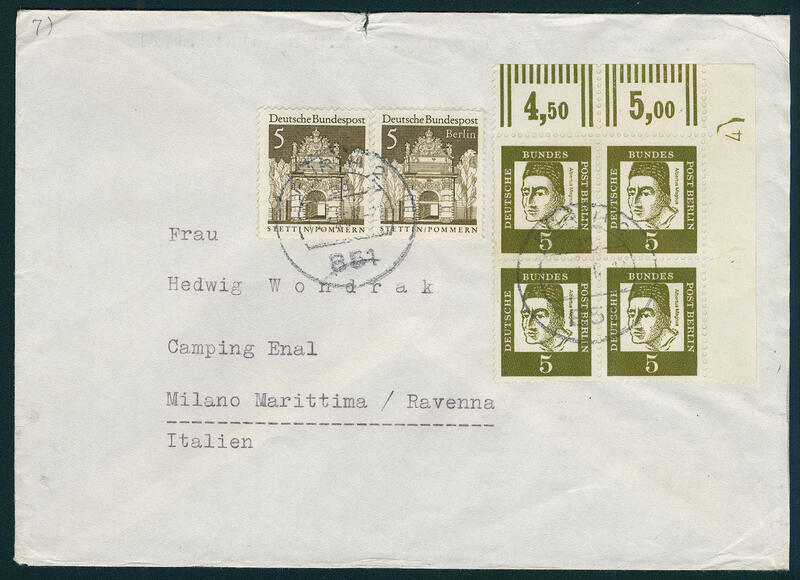 Important German, corner margin block of four top right with printer sign \"4\", in perfect condition with additional franking on cover, cover slight traces of usage, from \"FÜRTH\" to Italy with arrival postmark. 6550 219U 10 Pfg. 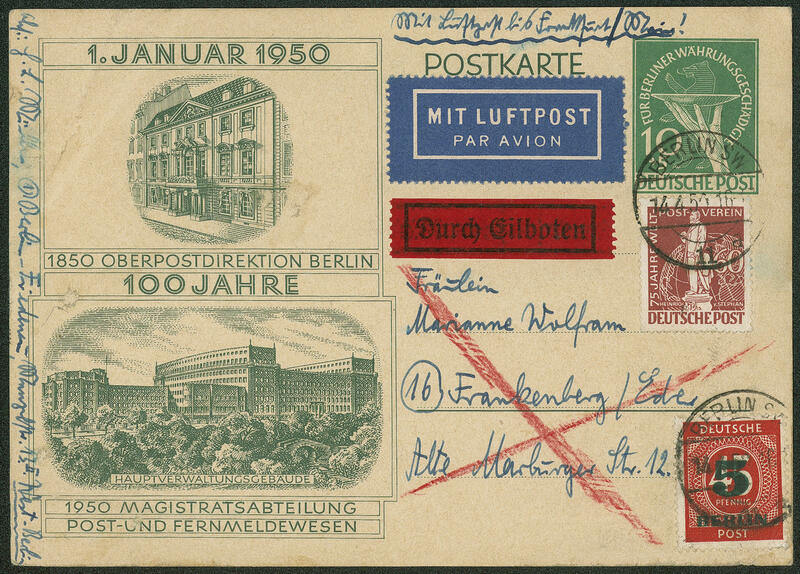 Old Berlin 1962, four sides unperforated from the left lower corner of the sheet, in perfect condition mint never hinged, without any signs. Very scarce variety! Michel 1000,- €. 6551 242/49 Small buildings 1964 / 65, 100 sets in the complete original sheet, as well 10, 15 and 20 Pfg. 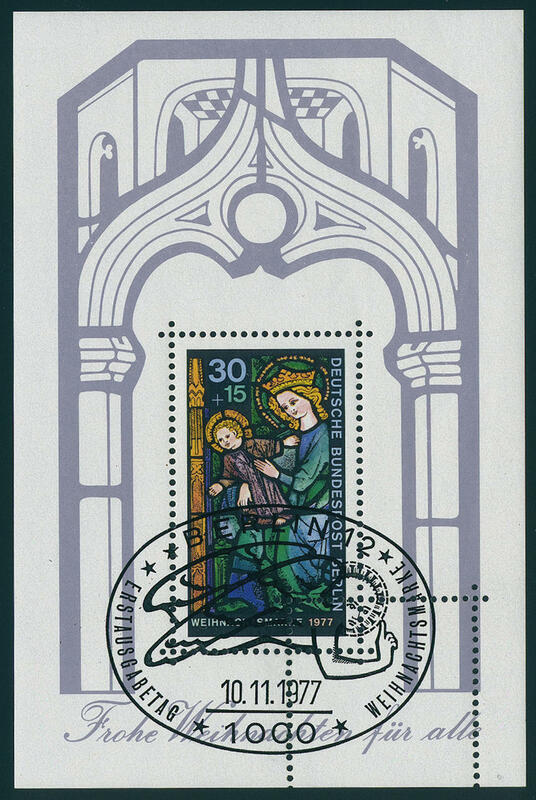 With printer sign, unfolded and in perfect condition mint never hinged Michel 3300,- €. 6552 266I 10 Pfg. 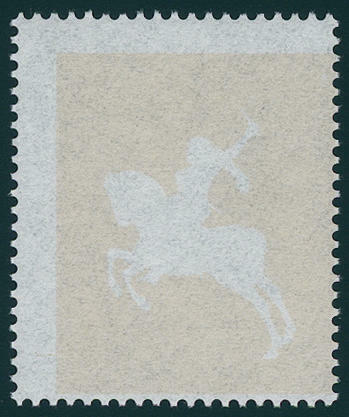 Welfare 1965 with plate flaw \"green spot in the folds at the thigh\" in the corner margin block of four with normal stamps se-tenant, in perfect condition mint never hinged Michel 160,- €. 6553 VK 442,445Proben 20 Pfg. And 70 Pfg. 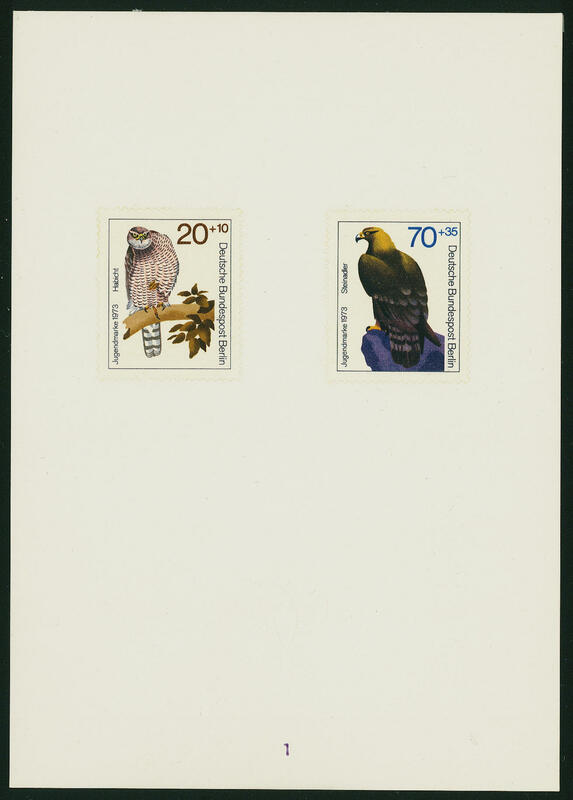 Birds 1973, perforated trial proofs in the original colors on specimen cardboard with stamp seal \"Federal Printing Office\" and on the back dated postmark \"20. 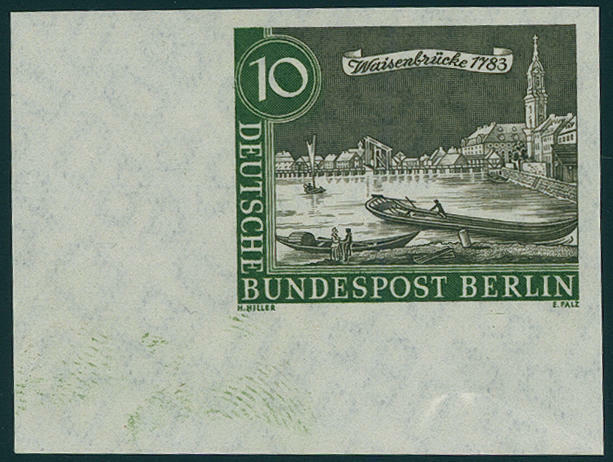 Oct 1972\", a significant rarity for the advanced special collection from Berlin respectively bird motif! 6554 VK 443/44Proben 30 Pfg. And 40 Pfg. 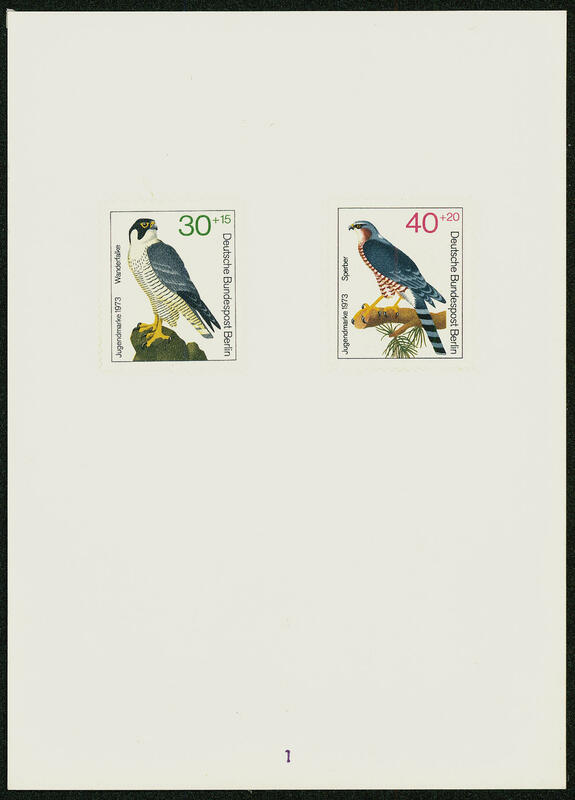 Birds 1973 as perforated trial proofs on specimen cardboard with stamp seal \"Federal Printing Office\". As well the 30 Pfg. In the original colors, the 40 Pfg. With clear modified colors (feathering red / gray blue / dark blue in lieu of brown / yellow / black, as well to claw in orange yellow in lieu of pale brown). 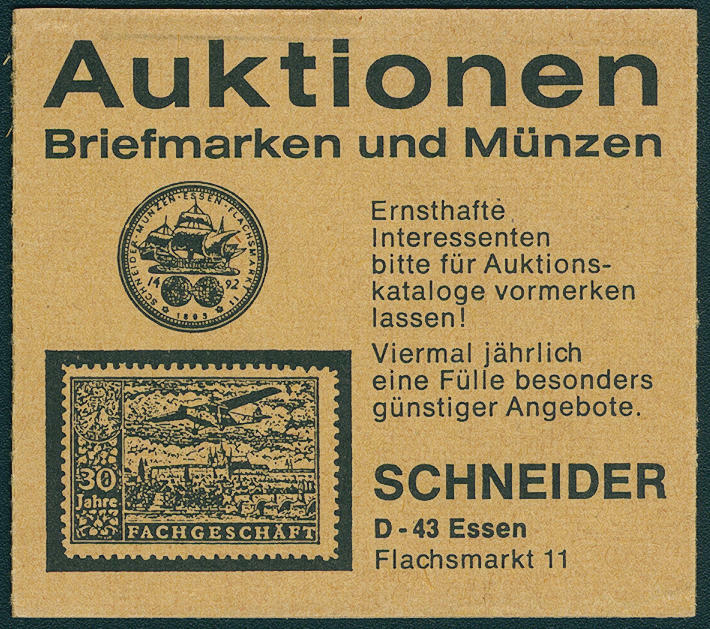 A significant rarity for the advanced special collection Berlin or bird motif! Photo expertize Schlegel BPP. 6555 497Pa 30 Pfg. 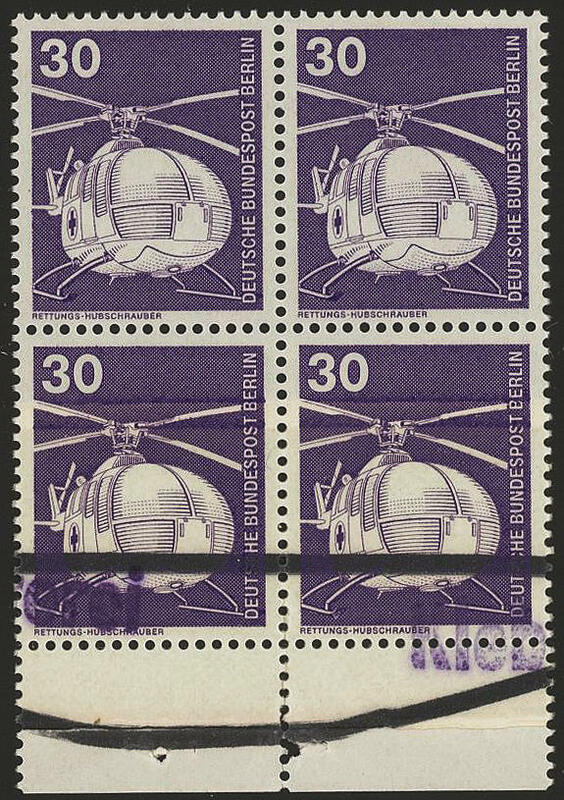 Industrial and technique 1975 (emergency rescue helicopter) block of four from lower margin with spectacular variety \"glued paper web\", of the Federal Printing Office as spoilage marked, in perfect condition mint never hinged a spectacular varieties rarity and in this kind seeming unique! By Michel catalogue up to now unknown. Photo expertise Hans-Dieter Schlegel BPP. 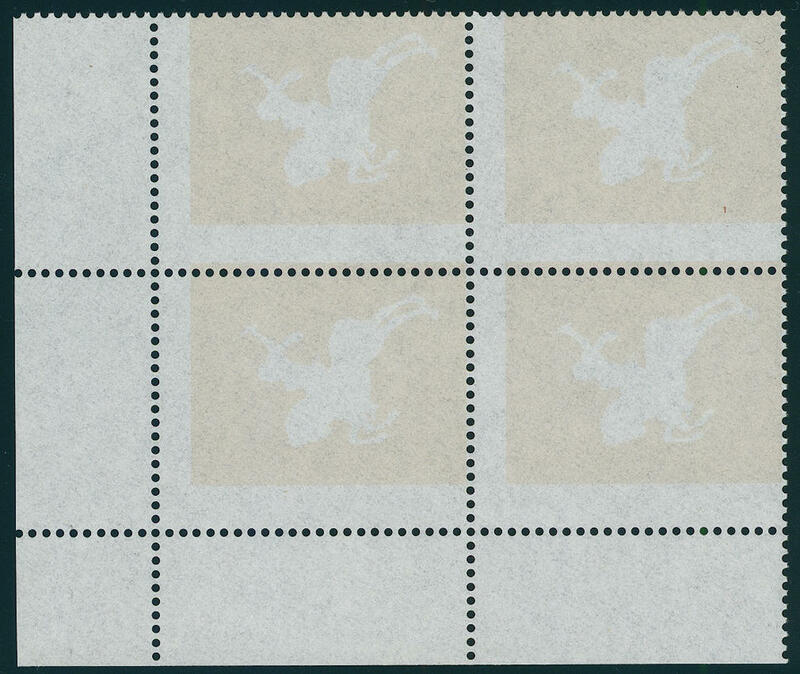 6556 ⊙ Bl.6Abart Christmas souvenir sheet 1977 with very decorative and extremely strong displaced double perforation, in perfect condition with first day special cancel \"BERLIN 10.11.77\". A very decorative and extremely scarce variety! 6557 Bl.7U Christmas souvenir sheet 1978 unperforated, fresh colors and in full original size, in perfect condition mint never hinged a very scarce variety, of the only a few copies became known are. Photo expertize Schlegel BPP. 6558 725U 60 Pfg. 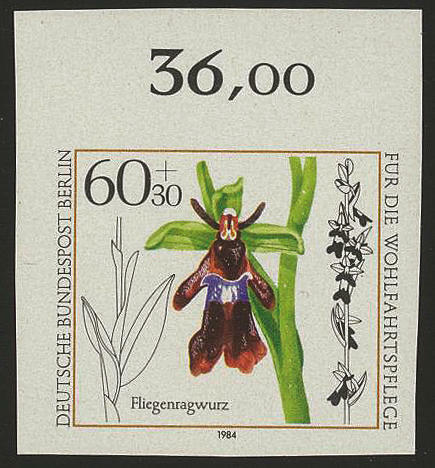 Welfare 1984 (orchids), four sides unperforated from upper margin, in perfect condition mint never hinged an extraordinarily scarce variety, the only in few copies have become known is! Photo expertize Schlegel BPP. 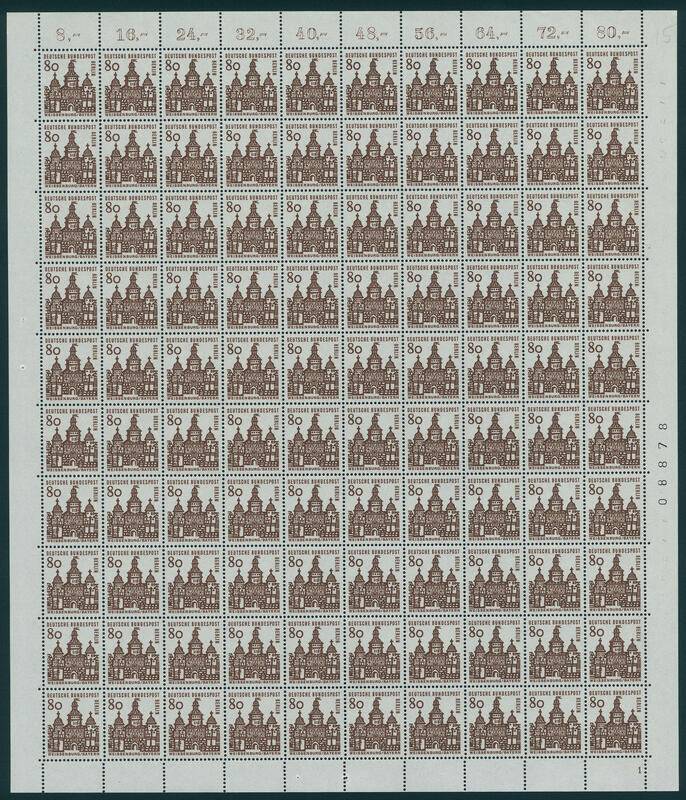 6559 793/844ex Sights 1987 / 90, all 15 values complete in the complete original sheet to 100 values, unfolded and in perfect condition mint never hinged Michel 4100,- €. 6560 860FII 100 Pfg. 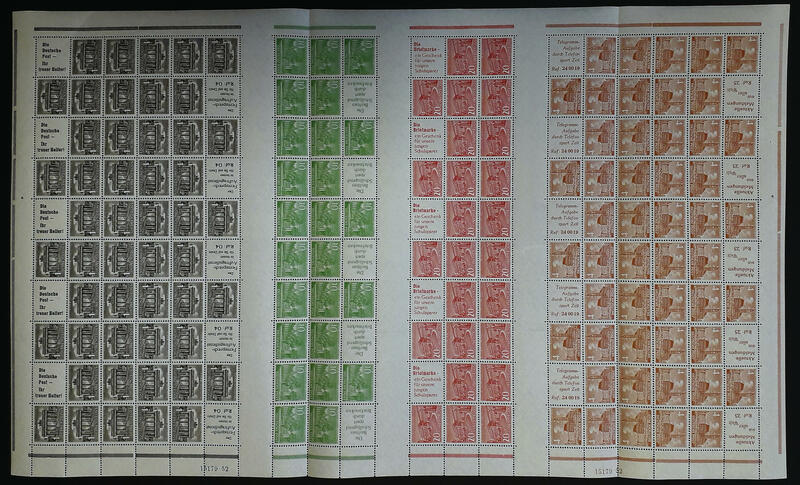 Postal service connection 1990 with printing error \"colour dark red brown (engraved printing) and gray brown (offset printing) missing\" block of four from the left upper corner, unfolded, in perfect condition mint never hinged additional is the printing still shifted. A Berlin rarity! Photo expertize \"the condition is perfect\" Andrew Schlegel BPP. Michel 6000,- €. 6561 860FII 100 Pfg. 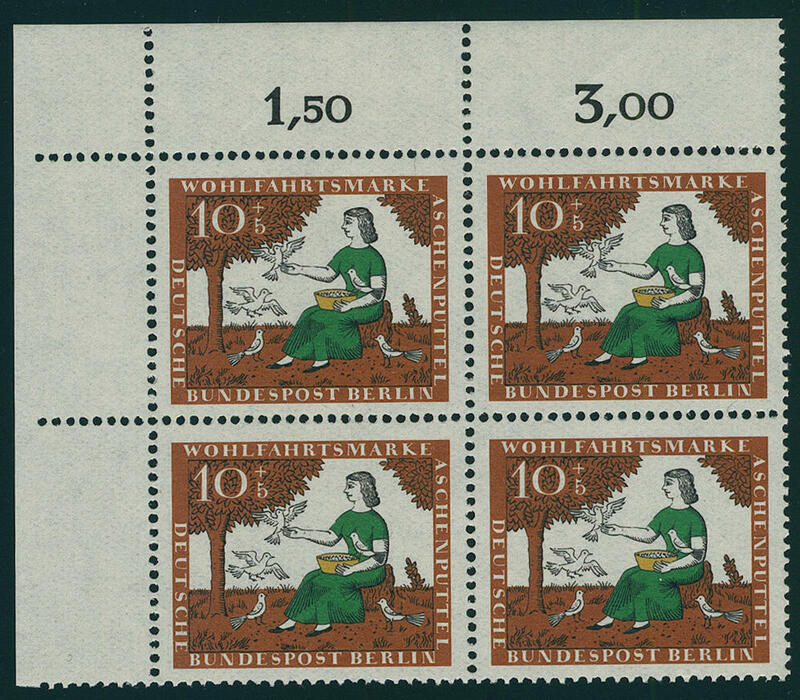 500 years international postal service connections in Europe 1990, with rare variety \"colours dark red brown and gray brown missing\", as well slightly shifted printing, in perfect condition mint never hinged a scarce variety! Photo expertize \"the quality is perfect\" Andrew Schlegel BPP. Michel 1500,- €. 6568 152vR 70 Pfg. Shimmer theater, strip of five with counting number \"0460\", unfolded, in perfect condition mint never hinged Michel 480,- €. 6569 ✉ P22 10 Pfg. Monetary reform vitims, postal stationery with additional franking 60 Pfg. Stephan and 5 Pfg. 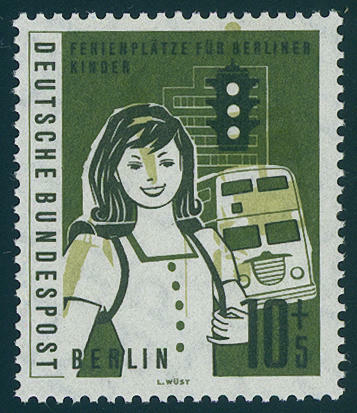 Green overprint, requires moderately used with a lot of text as registered airmail, correctly franked from \"BERLIN 14.4.50. \" to Frankenberg. Very scarce utilization! 6567 2 Buildings stamp booklet sheet 1951, wonderful fresh colors and in original size, as usual from of the philatelic agency twice horizontal in the perforation prefolded, left only in the margin once minimal separated, in perfect condition mint never hinged with house order number \"15179.52\". 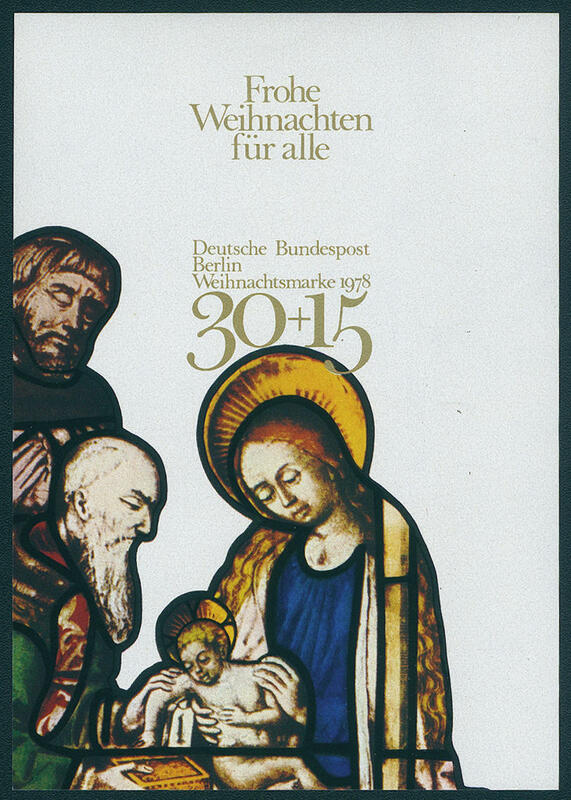 An above average very fine copy this large Berlin rarity! Michel 6000,- €. 6563 6c Brandenburger Tor stamp booklet 1970 with rare advertisement \"SCHNEIDER\", in perfect condition mint never hinged in perfect condition. Photo expertize \"the quality is perfect\" Hans-Dieter Schlegel BPP. Michel 1000,- €. 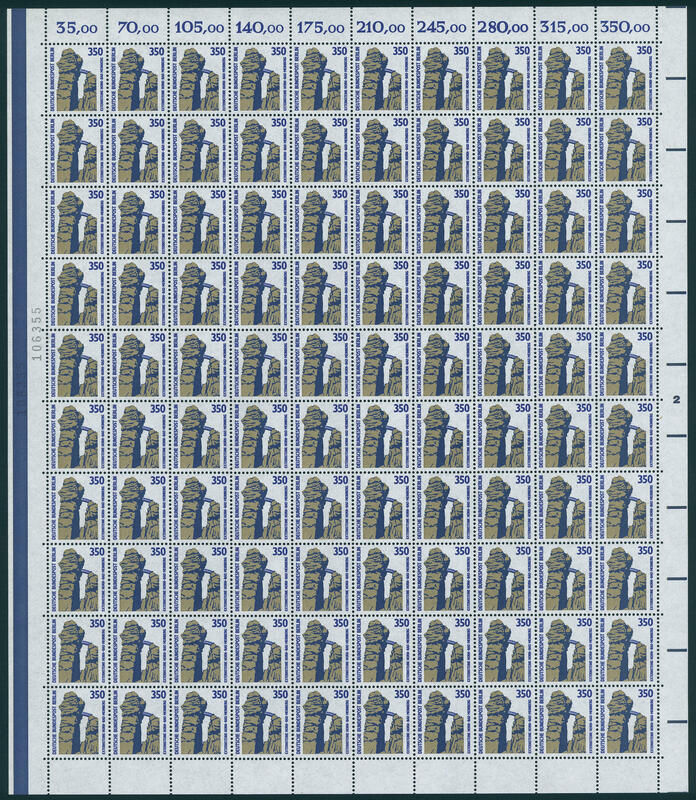 6564 10bb Castle and palace stamp booklet with peaked compensation perforation above, in perfect condition mint never hinged, photo expertize Schmidl BPP. Handbook 260,- €.